Simple, easy to understand information that when applied will do what the title of the book suggests. This came out quite a few years ago and alot of the info is not as groundbreaking as it was back then. 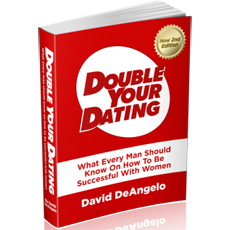 Double Your Dating sets you on the path to being a natural with women. It doesn't focus on all the technical details and over-complicated formulas of some dating gurus, it gets down to the basics. It helps to give you the right mindest and outlook on your interactions with women and clues you in as to what really causes attraction. I went from being incredibly nervous around women to being able to flirt with ease after I adopted the principles in this book. Another benefit of the book was that I started having a lot more fun when talking to women, which made everything flow that much more smoothly.